The whole 3D thing is like so early 2010, right? Video artist Don Whitaker has already moved on, using a software script to convert ocean footage into what he imagines a 4th dimensional perspective might be. Sober viewing is encouraged. 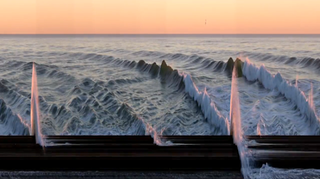 Whitaker, a nature enthusiast, used his footage of the beautiful Oregon coastline as source material, before mutating it into the surreal and haunting scenes above. Whitaker's script—written in Processing, an open source programming language geared for the visual arts—takes a vertical slice of a video frame, stacks it horizontally, and then takes another vertical slice from the next frame. The result is footage that is stretched across both time and space. "I like to think that this is what you might see if you looked at our world from a spot in the fourth dimension," Whitaker explains.